Key difference: Hardware is the physical aspect of the computer, the thing we can touch, such as monitor, hard drive, etc. Software is the non-physical aspect which includes the operating system, applications, programs, etc. 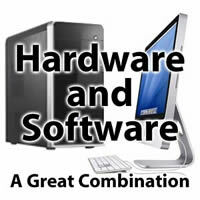 A computer is mainly divided into two parts, the hardware and the software. All of the computer’s components fall under either of these categories. The hardware is the physical aspect of the computer, things that we can touch, while, software is the non-physical aspect. The easiest way to distinguish among the two is that anything we see when the computer is off is the hardware, while anything we see on the monitor is the software. Hardware is the actual components that your computer is made of, such as the monitor, keyboard, CPU, etc. Without hardware, the computer would not exist and the software would have nothing to run on. The software, on the other hand, is any program that you load onto a computer, such as the operating system, the server, the web browser, media player, etc. It is the code and instructions that tells the computer hardware how to operate. This code can be viewed and executed using the hardware. The hardware serves as the delivery system for software solutions. It gives something for the software to operate on. A computer can run without installed software. However, if an operating system or interpreter is not found, the computer would either generate an error or sit at a black screen. The software enables a computer to perform a specific task. Additional programs give the computer additional abilities. Once installed, the hardware of a computer is infrequently changed, as it rarely fails. However, it does wear out over time and tends to have increasing failures at the last stage of its life. Software, on the other hand, does not wear out over time and does not have an increasing failure rate over its life. It does tend to become outdated, but it is readily created, modified, updated or erased on the computer. There are various types of hardware, including input devices – which are used to input data into the computer; output devices – which allow the data to be seen; data storage – which store data; data ports – which allow connectivity between the computer and other devices; and the computer care – which is the base unit and includes the base components essential for the computer to run. Its only use for school .!!!!!! Intrested to look up to,and given more knowlege to understand basic question.